A run-of-the-mill lottery site at first glance, PlayHugeLottos proves there’s more to it than meets the eye. PlayHugeLottos operates under the Play UK umbrella of online lottery websites. It functions as a hybrid lottery site, acting as a lottery agent or lotto betting operator depending on the game. At first glance, PlayHugeLottos looks like a run-of-the-mill lotto website, but offerings like instant-win games and systematic forms add surprising depth to your options here. There are minor quibbles that keep the site from reaching the levels of heavyweights like theLotter, but there’s still enough here to be worth your while. PlayHugeLottos traces its roots back to a UK Lottery playing site, PlayUKlottery.com, that was conceived in 1998. The website counts 2 decades of experience in online lotteries all over the globe, and it has several sister sites that cater to different countries and languages. PlayHugeLottos is run by Secure View Services Ltd., a company based in Cyprus. PlayHugeLottos is a hybrid lottery website. This means that it operates as both a lottery agent and a lotto betting site. Some games might have you entered as an official participant (i.e., with your own ticket for the actual lottery), while others might have you placing wagers on the outcome of a lottery game. As a hybrid site, PlayHugeLottos switches between two modes. For lotto betting games, PlayHugeLottos functions as a bookmaker for players. Instead of official joining a lottery game, you’ll be wagering on a lottery draw’s outcome. Any winnings will then be paid out through PlayHugeLotto’s own funds or successful claims from its game insurance policies. On the other hand, as a lottery agent, PlayHugeLottos buys lottery game tickets for players. Any winnings will be paid out by the lottery operator. You can use your official ticket to claim big prizes. However, PlayHugeLottos isn’t transparent about which games use lotto betting and which ones you can get official tickets for. In fact, when I asked representatives, I discovered that even they didn’t know which games would use lotto betting. Apparently, their insurance provider makes that decision. Here’s a quick tip: If PlayHugeLottos’ advertised jackpot is different from the official game’s top prize, then you’re probably looking at a lotto betting game. It can be troublesome keeping up with lotto prizes, though. If you’re averse to lotto betting, you might want to steer clear of PlayHugeLottos. Solo play: You can buy up to 30 tickets in one go for your chosen draw, or up to 50 tickets if you choose Quick Pick. Bundles: Pre-purchase discounted Quick Pick entries for your preferred lotteries, playing all draws over your chosen period. Rapid play: One-click subscriptions for your preferred lotteries. 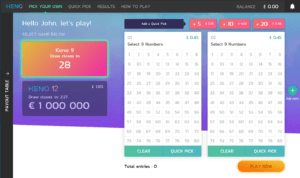 Intelliplay: Program the system to automatically enter you into any lottery games that match your custom criteria (e.g., a certain jackpot amount). Extra numbers: PlayHugeLottos’ version of systematic forms, this allows you to play all possible combinations from your chosen set of numbers. PlayHugeLottos has a quick registration process. It takes less than a minute to create a PlayHugeLottos account. However, you’ll need to provide more information than usual. Aside from the standard email address, name, and password, PlayHugeLottos also asks for your birthdate and mobile phone number. There’s also a login button found at the top of every page of the website. LottoPoints Reward Program: PlayHugeLottos lets you earn points for every non-discounted ticket you buy through the site. Once you reach a certain tier, you can swap your points for free tickets. You earn points over 30-day cycles, so your reward tier will be checked and updated every month. Sign-up bonus: You can get up to 20 free tickets on your first purchase after you register for an account. PlayHugeLottos offers 17 of the biggest lottery games from all over the world. PlayHugeLottos’ roster of lottery games spans the massive Mega Millions to more modest games like France Loto. You can also play in millionaire raffles and seasonal lotteries like Spain’s Christmas-themed El Gordo Navidad. It’s a good, if limited, selection that works well for beginners or casual players. Of course, lottery sites like theLotter get bonus points for offering a wider range of games. But these can be intimidating for people who just want to pick up a few tickets. Sites like PlayHugeLottos hit a sweet spot of convenience, variety, and approachability by offering the most popular major lotteries. PlayHugeLottos offers 2 Powerball games to choose from. You can check out both the massive US Powerball and its more modest cousin, Powerball Australia. Both offer millions in jackpots, and PlayHugeLottos offers the same convenient ticket purchasing process for both games, too. PlayHugeLottos offers Mega Millions and Mega Millions Max options. What’s the difference? Mega Millions is the official multi-state US lottery game. Mega Millions Max, meanwhile, is a lotto betting game run simultaneously by PlayHugeLottos. Jackpots can run higher than the official game, but outcomes for Mega Millions Max are always based on the official game’s winning numbers. Occasionally, PlayHugeLottos will also run a “superdraw” for Mega Millions Max. During these draws, the jackpot can be multiplied further, so you could stand to win much more. If nobody hits these “superdraw” prizes, though, they don’t get rolled over to the next “ordinary” draw. PlayHugeLottos lets you join the UK National Lottery. PlayHugeLottos is one of the few lottery websites that will let you play the UK Lottery online. 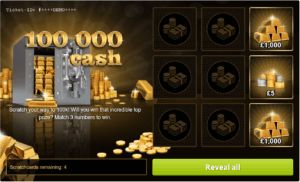 Most competitors tend to leave out this game, mostly because there are official options for playing the UK National Lottery online. By offering the game, though, PlayHugeLottos opens up opportunities for players who don’t reside in the UK. If you’re one of them, this might be one of your better bets when it comes to playing the UK lottery. 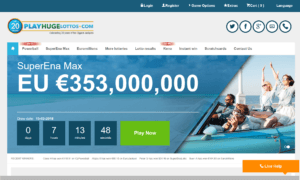 PlayHugeLottos reports results for the 17 lotteries it offers. You can check PlayHugeLottos’ results page for up-to-date results for all the games offered by the website. This includes the unofficial lotto betting games (e.g., SuperEnaLotto Max) that use the official games’ winning numbers as basis for their own outcomes. PlayHugeLottos offers 18 different scratch cards. If you’d like a change of pace, PlayHugeLottos also offers virtual scratch cards. These work like real-life scratch cards, so you’ll usually have to find or match a specific set of symbols to win a prize. There’s a good spread of games here, and you can play demo games if you’d like to check them out before betting any of your money. 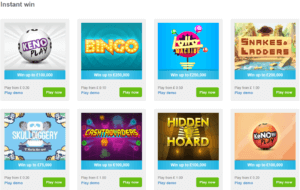 Prizes can go as high as £250,000 — not bad for a quick game that costs £0.50 – £3 a pop. Aside from virtual scratch cards, PlayHugeLottos offers 10 instant-win games that range from virtual slots to different themed minigames. You can choose from titles as varied as the retro arcade-themed Cashtrovaders to the pastel-goth Skulldiggery. Like scratch cards, prizes can go as high as £250,000. You can choose from 4 Keno games if you’d like a different spin on lottery-like mechanics. Draws are held every 3 minutes, so this is great for those looking for more excitement. You can pick your own numbers or leave your fate to PlayHugeLottos’ Quick Pick random number generator. Bets cost around £1-2 each. PlayHugeLottos lets you enter two of the biggest millionaire raffles available: Spain’s Christmas raffle, El Gordo Navidad; and El Niño, the Spanish New Year raffle. PlayHugeLottos doesn’t offer group play options. You might be tempted by PlayHugeLottos’ bundles, but these aren’t designed for group play. They function more like subscriptions than lotto syndicates. No, PlayHugeLottos isn’t a scam. It’s got two decades of experience under its belt. The website is owned and run by a legitimate company, the Cyprus-based Secure View Services Ltd. Its holding company, Play UK Internet N.V., also holds a gaming license from the Curacao government. Yes, PlayHugeLottos is operated by a real company called Secure View Services Ltd. The company, through its holding firm Play UK Internet N.V., holds a gambling license from the Curacao government. Yes. PlayHugeLottos uses a 128-bit SSL certificate to secure its website. All credit and debit card transactions also use 3D Secure technology for verification and protection. Is PlayHugeLottos a real or fake company? PlayHugeLottos is run by a real commpany called Secure View Services Ltd., which operates through its holding company Play UK Internet N.V., an entity duly licensed by the Curacao government. The Cyprus-based Secure View Services Ltd. owns PlayHugeLottos. How does PlayHugeLottos make money? PlayHugeLottos earns purely from its handling fees (already part of ticket or bet prices). It doesn’t take cuts from players’ winnings. Major prize payouts are funded either by the lottery operator itself (for games where PlayHugeLottos acted as a lottery agent and bought tickets on players’ behalf) or PlayHugeLottos’ insurance providers (for games where the site acted as a lotto betting bookmaker). Yes, PlayHugeLottos is legal, as evidenced by its gaming license from the Curacao government. Does Lottery Critic Trust PlayHugeLottos? Definitely. PlayHugeLottos holds a Curacao license, so we’re confident it undergoes regular checks and adheres to established gambling laws. Its SSL certificate could be better, but the effort that PlayHugeLottos puts into securing financial transactions through technology like 3D Secure more than makes up for it. PlayHugeLottos credits payments to your account. You don’t need to claim prizes in person — not even jackpots. PlayHugeLottos will put these directly into your account. You can use the money to top up your account funds, in which case you get a 25% top-up bonus. Otherwise, you can withdraw the money to your chosen bank account. Here’s the catch, though: for big prizes (think jackpots and similarly large amounts), PlayHugeLottos reserves the right to pay these out on an annuity basis. Unlike with regular operators, you don’t get to choose between annual payments or a lump sum withdrawal. PlayHugeLottos supports 24 different payment methods. You can withdraw your winnings by filing a cash withdrawal request through your account. You’ll get the money credited to your bank account in pounds, euros, or US dollars (depending on what you choose). There’s a minimum withdrawal amount of €10. Has anyone won on PlayHugeLottos? PlayHugeLottos doesn’t offer any details on previous winners. It does, however, claim to have a 100% payout record. PlayHugeLottos relies on a mobile site to serve users playing on phones and tablets. PlayHugeLottos lags behind the competition here, since it doesn’t offer a dedicated app. Even more strange is that the main website itself isn’t mobile-responsive. Instead, you’ll need to hop over to the dedicated mobile subdomain if you want a mobile-optimized playing experience. PlayHugeLottos’ customer support options are fantastic, but I had some minor issues. Alternatively, you can request that they call you instead, thanks to a call back feature. PlayHugeLottos also has live chat, which I got to try. The agent who assisted me was really helpful and knowledgeable. One caveat: live chat only comes in two languages, English or Portuguese. It isn’t available 24/7 either. 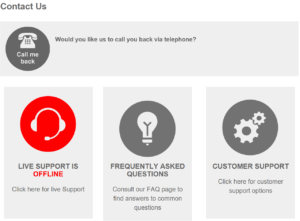 If live chat happens to be offline, you’ll be diverted to an online contact form instead. PlayHugeLottos’ website is quite easy to use, with some minor issues. For the most part, PlayHugeLottos is set up like any other lottery site. The games can be readily accessed right on the landing page if you want to purchase tickets immediately. Or you can dig deeper through their navigation menus and play the other games they have on offer. Even those not familiar with online lottery can easily get their bearings. It would have been ideal if they supported more languages (especially for the live chat) so even more people around the world can play easily. Another minor issue: For some reason, PlayHugeLottos decided to bury its FAQ in the “About Us” page. It’s not a huge deal, but for some people it might get confusing. At PlayHugeLottos, you can buy tickets and play games without any fuss. There are quick-buy options available throughout the site, so jumping straight to a ticket purchase takes less than five seconds. The purchase page itself uses the same design you’ll find on other lottery websites. You select numbers or opt for quick pick numbers. PlayHugeLottos is worth a try, but several minor issues keep it from being a true contended. PlayHugeLottos’ biggest strength is the fun new spins it puts on online lottery play. You get handy game options that offer good value and, in Intelliplay’s case, innovation. If you ever get bored of lotteries, you’ll also have alternatives like virtual scratch cards and Keno to help spice things up. Players looking for a dose of something different and exciting will find a lot to like at PlayHugeLottos. However, if you play exclusively in official games, the surprise lotto betting draws are might be a huge turnoff.